You might think actually I’m late with this post because we celebrated President‘s Day back on Monday. But as it turns out, today February 22 is really George Washington’s birthday. To honor the “Father of our Country,” I thought I’d take a look and see whether George Washington said anything that teaches us about the spirit of entrepreneurship and the principles of success that I teach today. As it turns out he did. I share the same view. It’s amazing what you can achieve when you have the right mindset. It’s how I got to my first million dollars and how you can, too – if you apply yourself, pursue your own advantages, and adopt an “I will succeed” view of your life and your business. Great lesson here. I’ve had plenty of success in my life, but there have certainly been failures along the way. The key? Make failure work for you by learning what went wrong so you can fix it in the future. But to do that you have to meet it head on and be completely honest with yourself When you just come up with crummy excuses, that’s indeed worse than no excuse at all. Here Washington reveals the importance of relational capital – who you know and, more importantly, who knows you. Your reputation means everything and amassing the right relational capital yields big dividends in the end. But pick these relationships carefully. As George Washington says, avoid “bad company” because negative people will just bring you down. As I said, while we celebrated President’s Day on Monday, today is really Washington’s Birthday – and it’s worth reflecting on what he said about life and business. 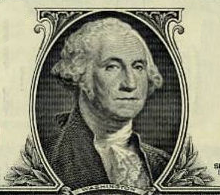 So take a $1 bill out of your wallet and look at that famous portrait of George Washington. There’s a lot we can learn from this great man who led us to victory in the Revolutionary War, became “the father of our country,” and left us much to think about when it comes to entrepreneurship, learning from failure, and building up your relational capital.